It is beginning to feel like we should be called "Eagles are US" here at REGI. Last night we had the dramatic rescue of a beautiful adult male Bald Eagle and this afternoon we picked up another Bald Eagle, although this time a 3-4 year old female bird. The male eagle from last night looks a lot better. You can see that from the photo. Don't let the photo fool you however, he is still in critical condition. We have tube fed him small amounts through the day. He is still very weak. I gave him a few small bits of meat, but he was unable to digest it. We are back to tube feeding him liquid diet until his body can process real food. 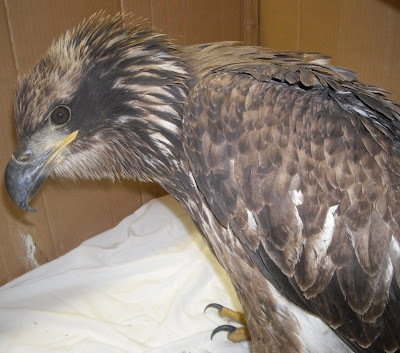 This eagle was not only stressed, injured and suffering from hypothermia when admitted, but he is starving as well. What a quadruple whammy for him to have to overcome. Tomorrow we will get xrays of his wings and his left foot if he is stable enough. So much rides on if his foot is going to recover. A Bald Eagle with one foot is not releasable to the wild. 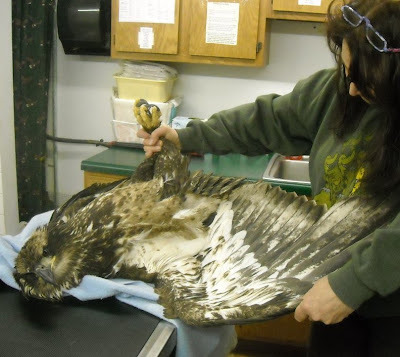 Keep your fingers crossed and positive energy coming for this eagle. He has been through so much. It is time for him to catch a break. 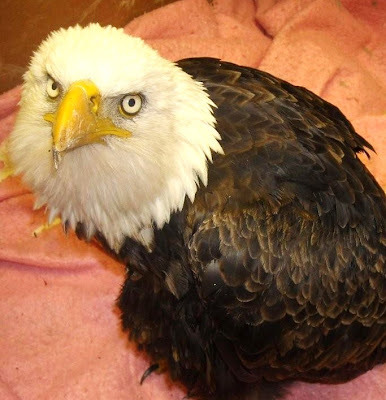 Tonight we drove again this time to Wausau to pick up the female Bald Eagle. 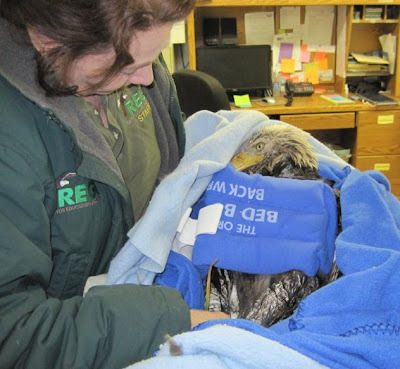 She was rescued and transported from Mead Wildlife Area. She is a big young lady bird between three and four years old. Bald Eagles do not get that distinctive white head and tail until they are over four years old, but it usually it is between five and seven years of age. 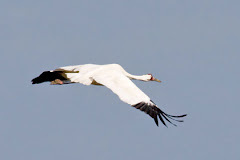 The white head and tail tells the world they are ready for breeding and all the responsibilities adulthood brings. This little lady is a survivor with a capital S. From the time she was captured she made it known that she was in charge and wasn't having any pity party from humans. I know our blogging public pretty well by now and I can "hear" you all wondering what the difference is between the male and the female Bald Eagle. 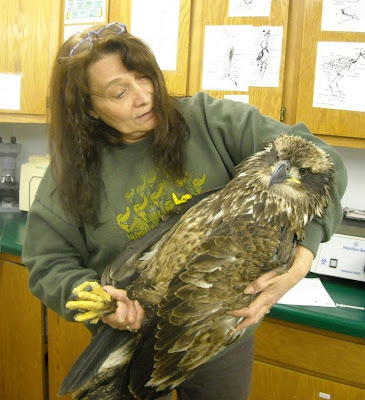 Size matters in the eagle world and actually for most raptors. The female is about 1/3 LARGER than the male. 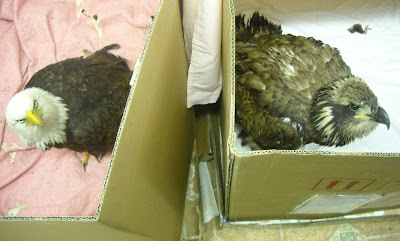 In the case of the two eagles in our clinic tonight, the female is slightly over twice his size. Here is the photo to prove it. That is no trick photography. The male is an older bird, I would say over 15 or more. The female still a kid at age 3 or 4. It was a long night and a longer day. I am off to bed without even proof reading this blog. Forgive me for typos I will fix them tomorrow. Lets hope tomorrow brings no more Bald Eagle Drama. Thanks again to everyone that helped get help for both of these beautiful birds.